In an earlier post, I described how the Smithsonian’s Triceratops was the first free-standing mount of this animal ever created, and the eccentricities of its proportions and posture would define how the species would be depicted in artwork and other reconstructions for the better part of a century. I should have clarified, however, that this was not the first time Triceratops fossils were put on public exhibit. That honor goes to the University of Kansas Natural History Museum, which was founded in 1864 and is still operational today. Among the Museum’s basement paleontology exhibits is a case of dinosaur fossils that has literally gone unchanged since the 1950s. Although this time capsule of mid-century museum design is of some historical interest, it would be nice if those sauropod limb bones weren’t labeled “Brontosaurus” (to be clear, the whole museum doesn’t look like this, the staff has been slowly but surely modernizing the exhibits). 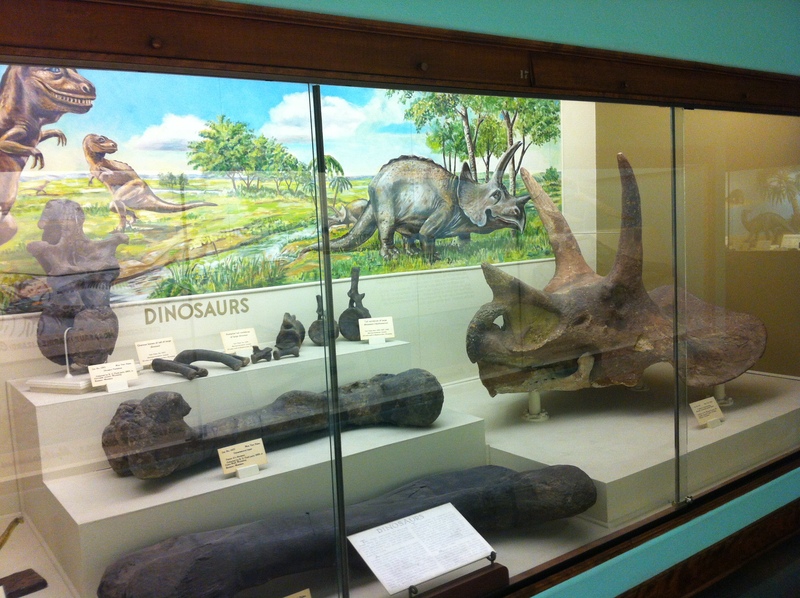 Of particular importance is the Triceratops skull (specimen 422) on the left side of the case. While there is no historical information on its label, this specimen has been with the museum for over 115 years, having been unearthed and put on display only six years after O.C. 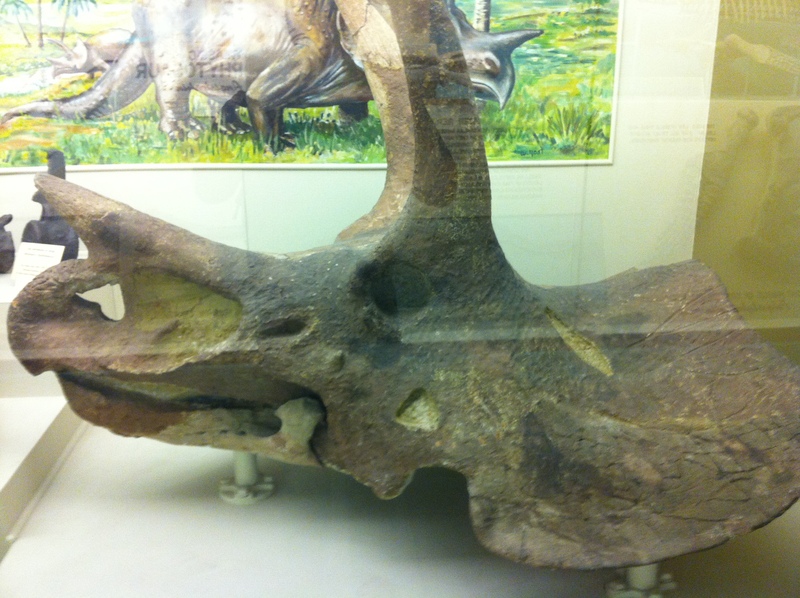 Marsh first named and described Triceratops. The dinosaur case at the KU Natural History Museum, untouched since the 1950s. The story of the KU Triceratops is not well-known, although it is the subject of the somewhat hard-to-find book (neither the Museum nor the KU library has a copy) A Triceratops Hunt in Pioneer Wyoming. In the summer of 1895, a team from the University ventured into the frontier lands of of eastern Wyoming with the explicit goal of finding a Triceratops for display at the young Natural History Museum. The team was led by Samuel Wendell Williston, founder of the University’s geology department. Although Williston’s specialty was entomology, he had previously worked under Marsh at Yale and was well-acquainted with the plethora of dinosaurs on which his mentor had published. Also on the expedition were KU Regent James Polk Sams, and two individuals whose names are quite familiar to anyone with an interest in the history of paleontology, Barnum Brown and Elmer Riggs. Brown would, of course, go on to be the star fossil hunter at the American Museum of Natural History, while Riggs would become a curator at the Field Museum of Natural History. In 1895, however, both were students, and not especially interested in fossil collecting or paleontology. The team found the Triceratops they were looking for on July 9, near the confluence of Lightning and Lance Creeks. By July 22, the skull was fully excavated and crated for a journey by train back to Lawrence. The fossil apparently garnered a fair amount of attention on the journey; while Triceratops is well known today, in 1895 few had any idea that animals such as this had ever walked the Earth. And yet, here was clear, physical evidence of an extinct animal like nothing alive in the modern world, and it would soon be displayed for all to see in the University of Kansas Museum. Triceratops skull retrieved by the 1895 Wyoming expedition. Furthermore, by setting out with the clear goal to find a dinosaur for display, the University of Kansas team were trailblazers in a movement that would lead to the inseparable connection between dinosaurs and museums in popular culture today. In the first decade of the 20th century, newly burgeoning large urban museums openly competed to find and display the largest and most spectacular dinosaurs. Exhibits like the AMNH Brontosaurus, the Carnegie Museum of Natural History Diplodocus and, of course, the Smithsonian Triceratops brought millions of Americans into museums, ensuring that to this day, when we think of museums, we think of dinosaur skeletons (and vice versa). In spite of the somewhat dingy basement display it currently finds itself in, the University of Kansas Triceratops was an early trendsetter and a profound example of the intersection of science and history. Kohl, M.F., Martin, L.D. and Brinkman, P., eds. (2004). A Triceratops Hunt in Pioneer Wyoming: The Journals of Barnum Brown and J.P. Sams. Glendoo, WY: High Plains Press.